Air Charter Advisors offers a variety of private jet charter and aircraft ownership services on the Legacy 500, a super midsize executive jet from Embraer. 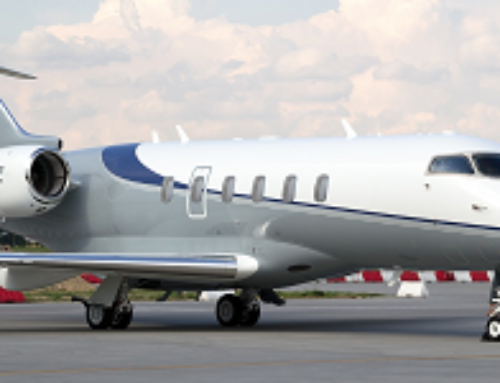 The Legacy 500 midsize business jet from Embraer S.A. The Legacy 500 is able to fly non-stop across the U.S. in both directions, and it’s the first midsize business jet with full fly-by-wire digital flight controls, offering a proven platform with room for improved performance, passenger room, and comfort. Featuring the widest-in-class cabin, a BMW-designed interior, and outstanding performance both on the runway and in the sky, the Legacy 500 presents strong competition to an established stable of workhorses in the midsize and super-mid segment. And it’s up the challenge, with performance, comfort and reliability ideal for domestic flights carrying up to 12 passengers, or small groups flying from NY to London, Paris, and Madrid. 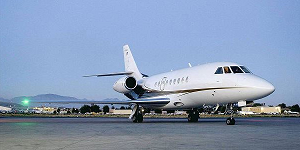 Air Charter Advisors offers executive and luxury travelers access to Legacy 500 private jets located around the world. Call us at 888-987-JETS for more information on Embraer Legacy 500 jet charter, jet cards, fractional programs, and ownership. 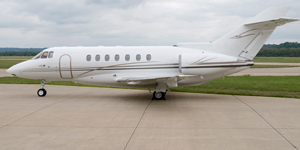 The hourly rate to charter a Legacy 500 starts around $4,800 – $5,500* per hour. Rates shown are examples only, influenced by availability, scheduling, routing, passenger and luggage amounts, and more. Looking for the best possible deal on your flight? 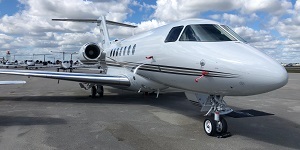 Ask your broker about Legacy 500 empty legs. If we find one that matches your routing, we can cut the cost of your charter flight by up to 50 percent or more! In 2007, Embraer Aerospace began development on the Legacy 500 with the goal of creating the first fully digital, full fly-by-wire midsize jet in business aviation. Embraer aimed to achieve this by introducing advanced technologies, improved performance, more efficiency, and increased reliability to a market dominated by Cessna, Hawker, Bombardier, and Gulfstream. 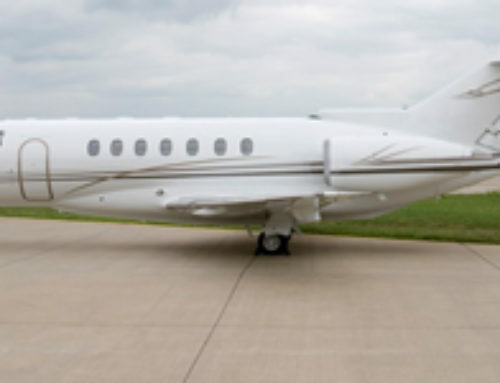 The Legacy 500 (EMB-550) is able to carry 4 passengers over 3,125 nautical miles and 8 passengers over 2,948 nautical miles, with flexible cabin configurations that allow for up to 12 passengers. The Legacy 500 is able to fly non-stop coast-to-coast at Mach 0.80 across the United States, even against 99% of annual winds, and still land with NBAA IFR fuel reserves. 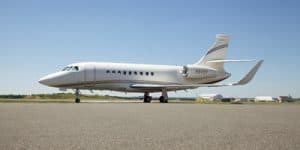 It’s often compared to the Citation Latitude, Gulfstream G150 and Learjet 60, however, given it’s outstanding performance, range, and cabin size, the Legacy 500’s closest competition is really the Challenger 300/350 and Gulfstream G280. After all, this aircraft wasn’t designed to merely compete with midsize jets. It’s price point, together with its superior design and performance, make it an attractive option within the super-midsize segment. 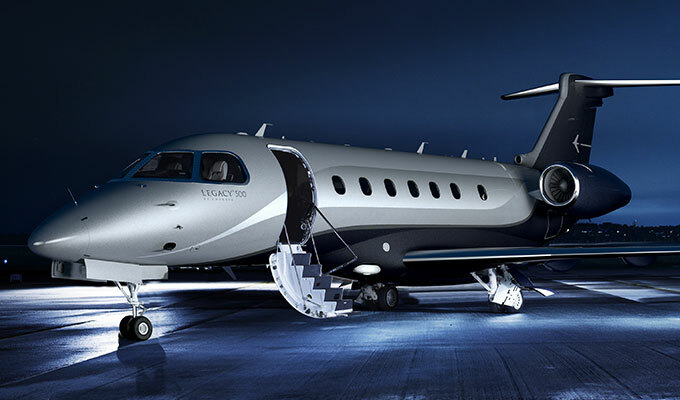 The results have shown, too — Bombardier dropped the price of its Challenger 300/350 to fall in line with the the Legacy’s $20 million price ($7 million cheaper). Meanwhile, Gulfstream remains firm on its G280 pricetag ($24 million). 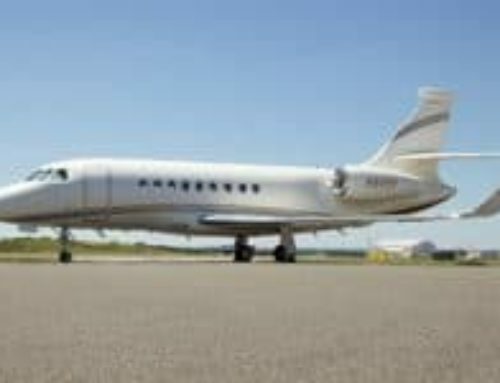 This may be in part to the Legacy 500 instantly losing nearly a quarter of its base value due to the sheer volume of super-midsize jets on the pre-owned market. At 6′ tall, 6’10” wide, and 26’8″ long, the Legacy 500 business jet offers one of the widest cabins the midsize class and a flat floor to maximize head room. The standard cabin layout accommodates 8 passengers in plush seats, with optional configurations including aft 3-place divan on both sides and a belted toilet and forward side facing seat to carry up to 12 passengers. The ergonomic seats fully recline and swivel, and lay flat to combine into 4 beds. 12 optimally placed windows allow light to enter the cabin at just the right angle. In addition to outstanding comfort, the cabin features a fully-equipped galley, the Honeywell Ovation Select Cabin Management System for ease of connectivity and control over in-flight entertainment, and luxurious details throughout it’s BMW designed interior. The Legacy 500 features an abundance of storage, with 40 cubic feet of pressurized and heated internal storage accessible during your private flight, and an additional 110 cubic feet of storage in the aircraft’s main exterior compartment, ideal for storing your golf clubs, ski equipment, and other gear. An optional heating is available in the exterior storage compartment. Passengers can enjoy true coast-to-coast range on the Legacy 500, able to fly non-stop across the United States in all directions. Powered by twin Honeywell HTF7500E engines each producing 7,036 lbs of thrust, the aircraft gets up to 5,000 feet and 329 mph in just over a minute, and it takes merely 22 minutes to reach its initial cruise altitude. After climbing to its maximum altitude of 45,000 feet, it’s able to reach speeds of up to 631 mph during short distance flights. The aerodynamically tuned 27-degree wing sweep allows for an average long-range cruise speed of 501 mph, while reaching mach 0.80 (613 mph) lowers flight range by 3%. The aircraft’s fly-by-wire control, unique in its class, enhances the safety and comfort of your flight. 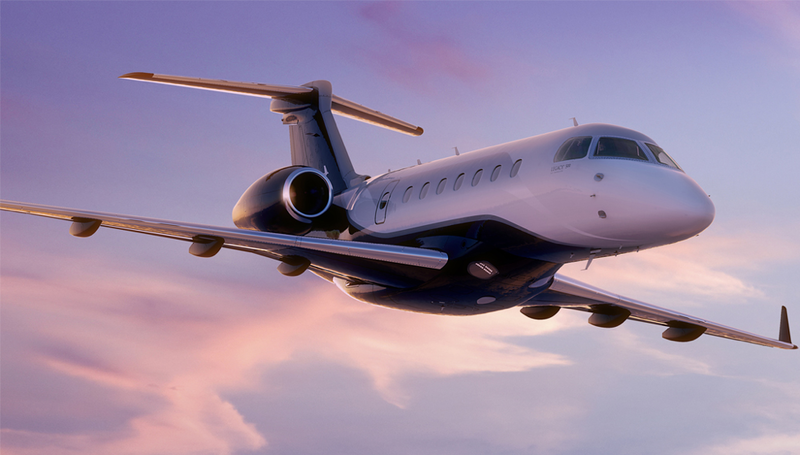 Embraer has set it’s sights on grabbing a piece of the midsize and super midsize business jet market, and the Legacy 500 makes a strong case to become a formidable slice of the pie. The aircraft’s superior cabin comfort and flexible layout make it an appealing option for executive groups who charter or operate frequent domestic flight. Advanced flight deck technologies and state-of-the-art avionics offer superior capabilities and functionality. Full fly-by-wire flight controls are unique in its class; large displays and cleaner cockpit design with sidesticks help keep pilots comfrtable and focused; it’s capable of paperless operations to expediate travel; it’s also ready for upcoming CNS/ATM requirements in the near future. Today, nearly 70 percent of Legacy 500’s are based in the US, with most owned by private firms and high-net-worth individuals. The number of 500’s operated on behalf of owners by management companies continues to increase, and fractional programs are swiping them up left and right as more hit the market. 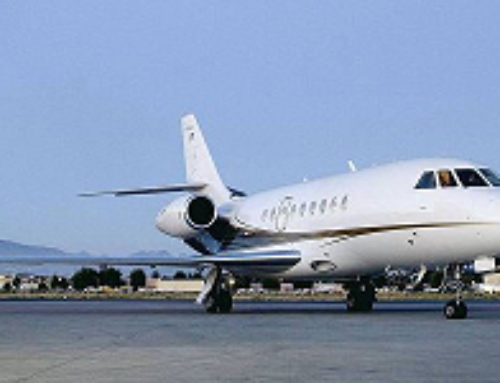 Air Charter Advisors assists with acquisitions and sales of Legacy 500 midsize jets, and we offer FAR Part 91 and FAR Part 135 and aircraft management and charter marketing services to offset the costs and maximize your ownership. 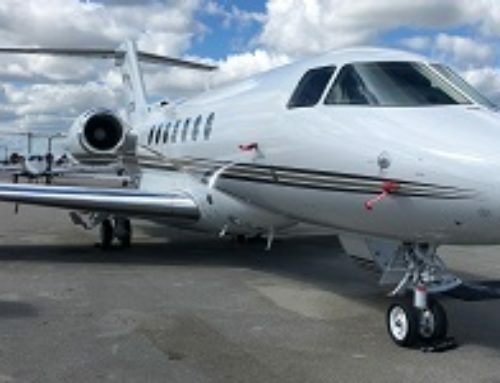 We also offer access to 25, 50, and 100 jet cards and fractional ownership programs for those looking for a more cost effective access to private jet travel without chartering on-demand. The Legacy 500 is an excellent choice for small executive groups making cross country trips, able to fly non-stop between NY, LA, Miami, Seattle, and everywhere in between. Transatlantic flights from New York are also available, placing destinations such as Paris, London, Dublin, Edinburgh, and Madrid within reach. Our private jet charter brokers offer a variety of services on the Embraer Legacy 500 business jet, from bespoke jet charter, last minute aircraft rentals and jet card programs, to fractional ownership, aircraft acquisitions, and private management & marketing services. Call ACA at 888-987-JETS (5387) or submit a request via our contact form for more information.